Striding onto the stage to the strains of ‘Enjoy Yourself’ by The Specials proved a Freudian entrance for The Mavericks in Birmingham this evening. Nearly two and a half hours later, the Symphony Hall had just witnessed a special performance and it would be nigh on impossible to find anyone who didn’t enjoy themselves. The band’s soiree at the top table of country music may have been twenty years ago but, led by the ever impressive Raul Malo, there are still plenty of tricks up the sleeve to teach the modern era about the class and style to inject into the genre. The Mavericks circa 2015 adopt a seamless twin headed approach to their live shows with a front three of Eddie Perez (lead guitar), Jerry Dale McFadden (keyboards) and Malo himself excelling on guitar alongside his stunning tenor vocals. In the absence of the now departed original bassist Robert Reynolds, the backbone of the band is a five piece featuring the horn pairing of trumpet and saxophone, accordion and a rhythm section of drums and double bass. In unison they put together a blistering set of scintillating music drawing on a heady mix of country, Latino, rock n’ roll, retro pop and even a hint of Ska. 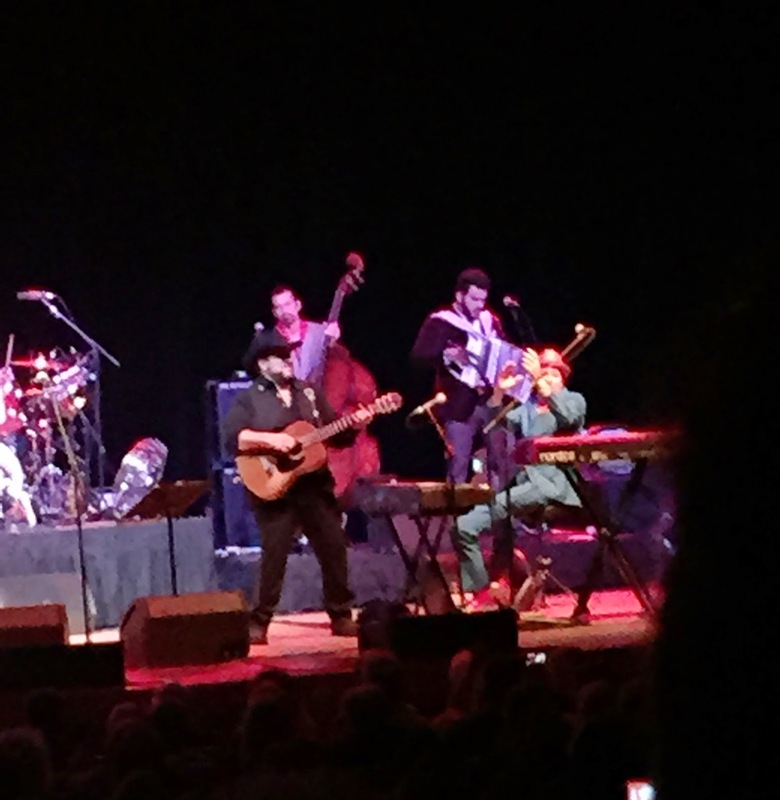 It was a night of few words from Malo as the band soared through a near thirty-song set highlighting their exceptional recording skills either side of a lengthy hiatus. Choosing to open the proceedings with their most well-known song ‘Dance the Night Away’, a UK No.4 chart hit in its day, may have proved intriguing to some observers but this song is far from their best and maybe it was a way of saying ‘here’s the hit, now wait for the real stuff’. One of the most impressive features of The Mavericks decision to reform in 2012 after an eight year break is that the two new recordings since have raised the bar of their back catalogue excellence. This latest tour is named after the most recent record MONO and this album was almost played in its entirety including reeling off half a dozen tracks in succession after the opening number. Among the highlights of this record, which should grow in momentum during the year, were ‘All Night Long’, ‘Out the Door’ and ‘Pardon Me’. The latter was a symbolic moment highlighting the band’s diversity as it was played when the horn section had a breather and Malo immediately switched into country mode. The highest compliment to pay to this record is that it even provided the evening finale with an entire Symphony Hall on their feet dancing to one of its leading tracks, ‘(Waiting For) The World to End’. The album IN TIME saw The Mavericks bounce back onto the music scene three years ago and a fair few numbers from it enhanced the set list led by ‘Back in Your Arms Again’, ‘All Over Again’ and ‘Dance in the Moonlight’. Of course it was not just all about the contemporary Mavericks as old favourites like ‘Because of You’, ‘There Goes My Heart’ and the foot stomping pre-encore finale of ‘All You Ever Do Is Bring Me Down’ all helped create a feel good wave of nostalgia and magnificence around a venue, as usually tuned to its sonic best. A three hour extravaganza of music had begun on the stroke of 7:30 with a support slot from London based band Hidden Charm. With a refrain from subtlety, the four piece combo comprising of three guitars, occasional keyboards and percussion unashamedly dealt a slice of 60’s inspired Brit Pop/Rock which was rapturously received by the early arrivals. As an opening act they certainly hit the right mark with a rising of the intensity straight from the first note. 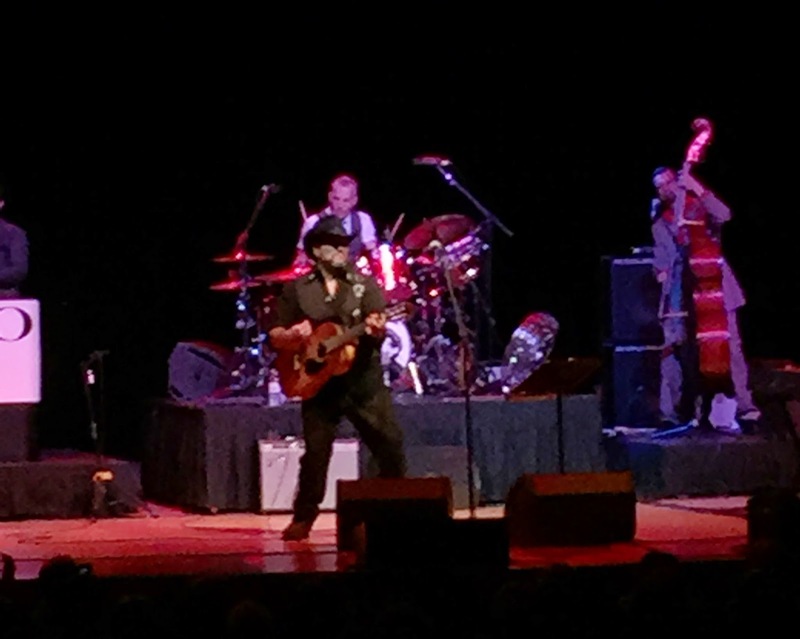 During the Mavericks hiatus, Raul Malo had developed his own solo career with numerous Birmingham appearances but he limited himself to just a singular moment in the spotlight this evening with a crooning version of ‘Mona Lisa’. As much of a star as Raul is, this show was all about the unity of one great band and how they demonstrated the ultimate value in the combined efforts of a well-oiled slick high class machine. On the first day of March, the renewal of The Mavericks as a significant force in the world of American roots music set down a marker for all 2015 gigs to follow.